Love this stoneware. Very bright and fun. The unique glaze, clay and high firing temperatures used to create this mug all result in extreme durability. Amaze and delight your family and friends with a unique, stunning works of art in the form of a handmade stoneware mug. 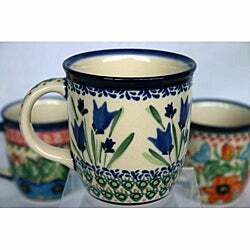 Love this Polish pottery. A friend of mine has some and I've always liked it.. Can't wait to get it!